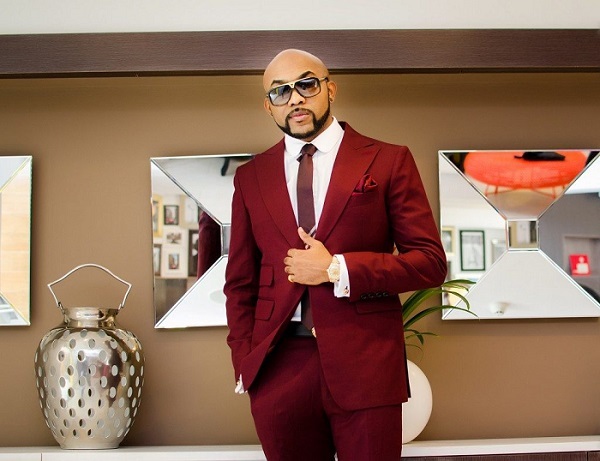 A business consultant recently took to Facebook to call out singer, Banky W, on his actions during the voters’ card collection exercise – this following his recent declaration of his intention to run for politics. 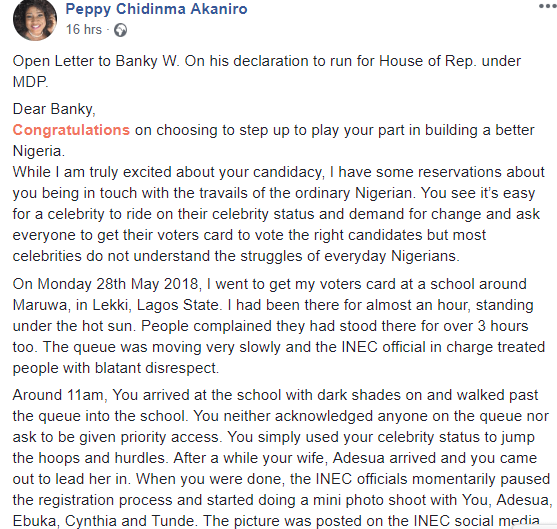 Peppy Chidinma Akaniro wrote what she called her open letter to Banky W on her timeline, sharing the incident that happened in May about how she and other Nigerians were waiting in line to collect their PVCs when Banky W arrived at the venue, jumped the line and went straight into the school in Maruwa, Lekki to be attended to. When his wife, Adesua, got there, he came out to lead her in so she could also get the attention of the officials, while those who’d been waiting on the queue all morning were neglected. 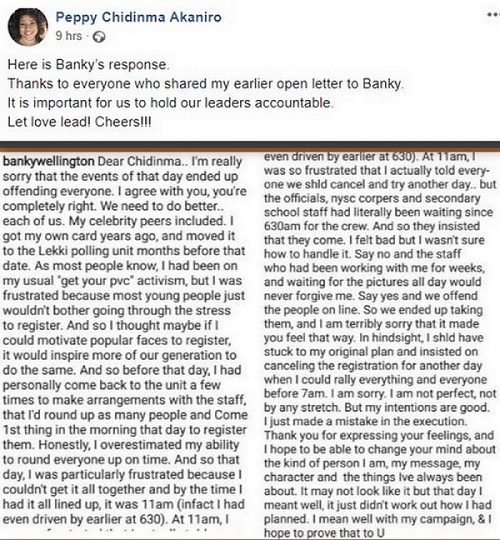 Chidinma went on to talk about how Banky did the same thing when Ebuka Obi-Uchendu, his wife Cynthia and Tunde Demuren all got there. 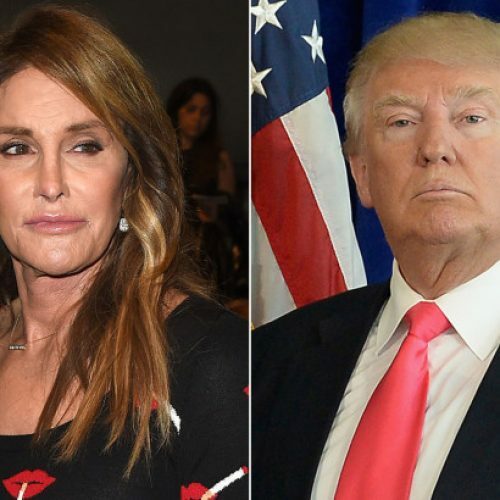 When they were done, the officials stopped attending to everyone else in order to spend time taking photos with the celebrities. 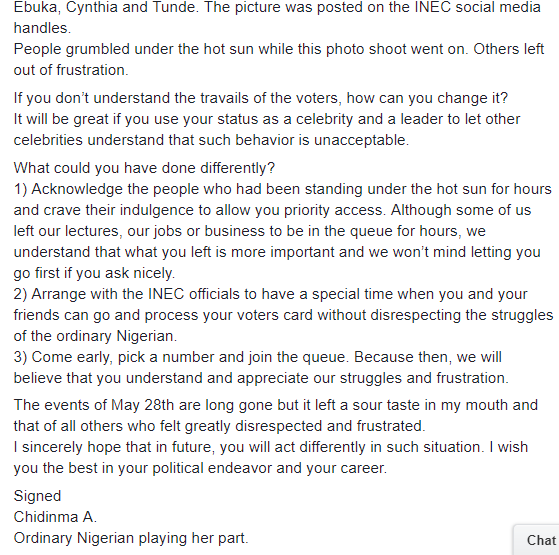 She pointed out that this attitude shows that Banky has no understanding of the travails of voting Nigerians and this makes it doubtful he’d effect any change when elected into office. 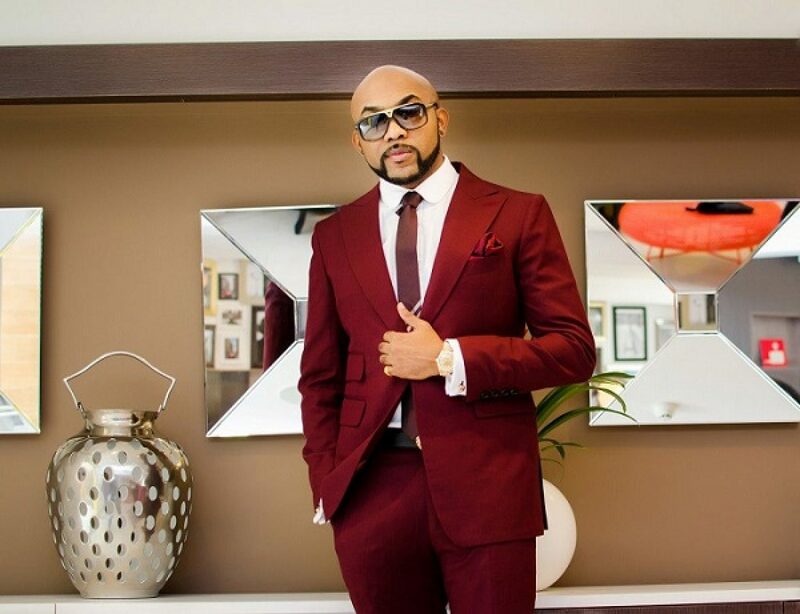 Banky has acknowledged Chidinma’s open letter in which he explained his side of things. Read below. Honestly I do not understand why this article is relevant on KD. You mean aside from the fact that it’s a post about an electoral situation potentially affecting Nigerians of which the Nigerian LGBT catered to by Kito Diaries is a part of? 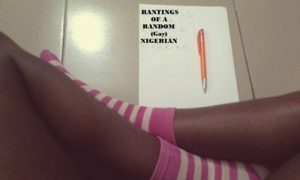 See the speed I used in clicking this article after seeing Banky and KD together. …Only to find out he wasn’t cheating on Adesua with Ebuka. Lol. Talk about table shaking!! !